Life in the fast lane is a blur. That’s how you know the throttle is being used properly. Sure, you can slow down and smell the roses… if they are at the gas station while you refuel your bike! 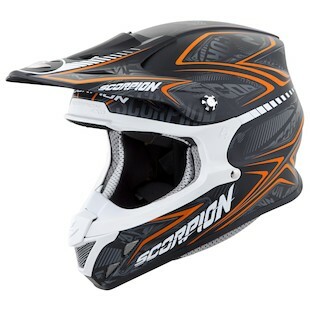 The new Scorpion VX-R70 Blur Helmet graphic is a new addition to the VX-R70 line and offers a new look on an old favorite. With a TCT composite shell that consists of five layers, blended together and interlaced, you can be assured that you are in a helmet designed to the highest degree. The AirFit liner inflation system help to provide a perfect fit, while Aero-tuned ventilation flows nicely through the KwickWick2 liner for maximized comfort on long days. The Blur colorway itself comes in blue, orange, red, and silver for a variety of visual options. So go fast, roll on the throttle, and if you are riding off-road, look for a helmet such as the Scorpion VX-R70 Blur to match.